Yesterday was Force Friday and stores all around the world were flooded with fun new merchandise celebrating the love of all things Star Wars. We gathered up a collection of a few of our favorite style pieces to share with you, starting out with Stormtrooper Style of the First Order. I love the ominous strength conveyed in this comfortable cotton shirt from the DisneyStore.com. 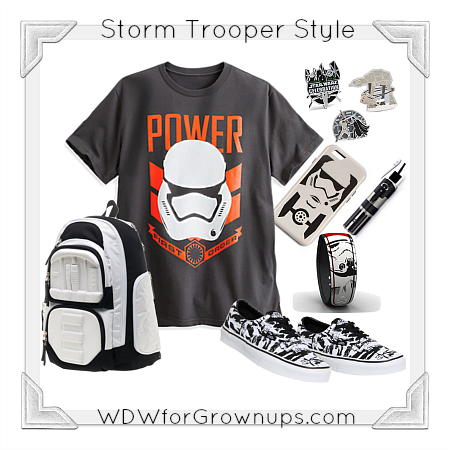 Star Wars accessories abound right now and this collection of Stormtrooper inspired gear has everything from Disney Pins and MagicBands, to a detailed trooper backpack and classic Vans. When you let The Force move you to cover your phone with a Stormtrooper case and pack a light saber power stick - you know you'll be able to answer when Vader calls. And as I was searching for something new for the Star Wars fans in my house, I came across this fantastic Sunset on Tatooine dress, so I decided to add a bonus look for her! 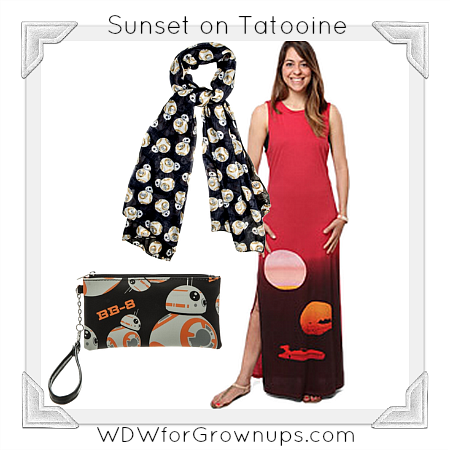 This sleek maxi dress takes you back to those warm summer nights in the desert, and I've accented it with a scarf and wristlet featuring the cutest driod ever, BB-8! I love that scarf! I think I'll definitely be getting it!